What is the brainstem? The brainstem includes the midbrain and hindbrain; the hindbrain develops into the pons and medulla. 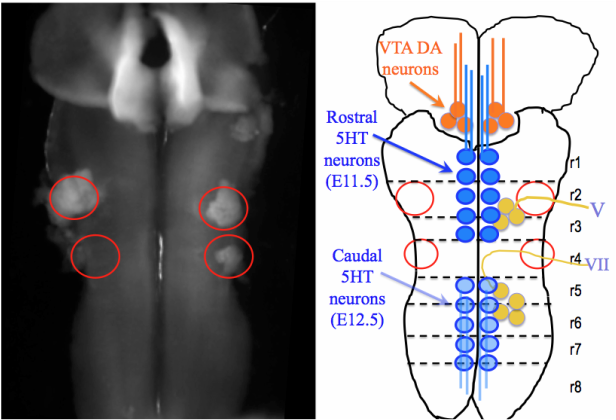 In addition to hosting the highway of axons tracts between the upper CNS and spinal cord, the hindbrain includes afferent sensory neurons and efferent motor neurons of the face, respiratory nuclei, relay nuclei of the auditory system, and several groups of widely ramifying modulatory neurons, including serotonergic, noradrenergic, histaminergic and peptidergic cells. The midbrain includes auditory and visual system relay nuclei and groups of modulatory neurons such as the dopaminergic neurons. What is spontaneous activity?﻿ This is electrical activity recorded during brain development. This activity has been shown to mediate aspects of neural development such as neuron number and phenotype, axon extension and pathfinding, and synapse formation and maintenance. We work on spontaneous activity in the embryonic brainstem, and have found that it is driven by midline cells of the hindbrain, and is dependent on serotonergic receptor signaling. We are examining whether spontaneous activity influences the development of modulatory circuits that originate in the brainstem. Learn about how spontaneous activity is driven here. Learn how spontaneous activity changes at each developmental stage here. The vertebrate brainstem includes the hindbrain and midbrain (and cerebellum). We focus on the development of modulatory neurons of the serotonergic (5HT) and dopaminergic systems, which are involved in emotional and behavioral regulation in the postnatal animal.